NATURAL HABITAT AND PREFERRED SITE: Throughout South and South Central Texas. Likes sandy or silty soil but can also take well-drained clays. It is adapted as far north as Austin and seems to be quite comfortable in landscape gardens. IDENTIFICATION INFORMATION: Small, spreading tree with rounded or flattened crown and feather-like foliage. Armed with 1 to 3 inch spines at the base of each leaf. FLOWERS AND FRUIT: Spring flowers are round, yellow and fragrant, fruit is woody pods, 1 to 2 inches long, almost black. Fruit forms mid summer through early fall as black to brown woody pods 1 to 2 inches long. Each pod contains two rows of shiny, hard, gray seed. FOLIAGE: Leaves are compound, feathery looking with tiny leaflets and yellow fall color. BARK: Reddish brown when young becoming furrowed and ridged with age. CULTURE: Huisache is a fast growing pioneer type plant. It grows easily in lousy soils and needs almost no care. PROPAGATION: From seed cuttings transplanting, very easy to propagate from seed because the seed are covered with a very hard seed coat, mechanical or acid scarification is sometimes necessary. Seed will germinate then in 7 to 12 days with proper conditions and warm soil temperatures. Without scarification, germination may take as long as a month. Cuttings can be made from softwood or semi hardwood taken in late spring or early summer. Transplanting is difficult on all but very small seedlings. PROBLEMS: Freeze damage in the northern half of the state and poorly drained soil are the only two problems the plant seems to have. Weevils will sometimes attack the seed if left on the tree too long. INSIGHT: It is sometimes confused with mesquite, but its wood is not good to use for bar-b-que because of the unpleasant flavor it can give food. It is said cattle given too much of the young foliage can produce bad tasting meat. Valuable perfume and honey plant. 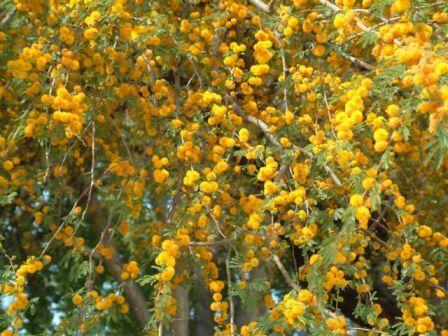 Huisache is a good tree for xeriscape landscaping.